With the help of my best friend, my bike had its semi-but-precious-makeover! Simply put, i have three good reasons to look forward to enjoy riding my mtbike more…. A TOPEAK Panoram V12 wireless cyclocomp – its kinda different from the standard cyclocomps in the market because it comes in widescreen version. Meaning I can see my riding information in a single glance. Sweet! I have been wanting to put a cyclo computer on my bike for long and i guess, my long wait was well worth it. Thanks to P as usual. Oh, I still have other SECRET bike gear upgrade wishes in mind but I’d better keep it a secret still. What I have for now will suffice. Meanwhile, I really hope to be back on the trail SOON. On July 19, a foot race will be held that is set to establish a lot of firsts in Philippine running history. The event, coined as Run for Home: The Globe-Ayala Land City Run for Habitat for Humanity initially represents Globe’s aim to help fund the Kapit Bisig para sa Ilog Pasig Project’s construction of resettlement houses in BAYANIJUAN in Calauan, a housing relocation site in Brgy. Dayap Calauan, Laguna. 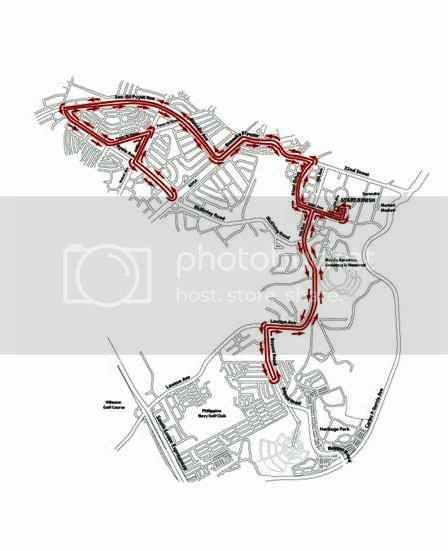 The race includes Ayala Avenue as a race route which is a welcome change for regular race participants who are already too familiar to the Fort Bonifacio and Roxas Blvd/MOA race routes. The race will make use of the disposable Champion Chip – a timing chip that will accurately record a runner’s actual start (not the gun start time) and finish times. Meaning, the Finish area will not be crowded since there will be no need for Finish Chutes for each race distances. Pixlink photo uploads and TATTOO blog booths in between distances. A photo gallery will be available on the GLOBE site post-race with search, picture publishing to SNS account, rate and tag photos functionalities. Run Analysis will also be available via RunPix which as I have gathered is the same tool used at the Singapore Marathon last year and on several USA-based marathons. RunPix provides analysis of your run by using images to enable you to visualize your achievement in 3 ways: compared to all entrants, within gender, and within division. FREE race pictures download from PHOTOVENDO. A food bazaar that is similar to the Salcedo Weekend Market will also be put-up at the race venue wherein an option to use GCASH as payment will be made available for people to avail of discounts. Registration fees are cheap (there is a promo and non-promo registration option) considering that timing chips will be utilized or the race. Reason for this is because Globe Telecom is subsidizing part of the race cost. Aside from water stations, 100 PLUS sports drinks will be available for runners for rehydration. What’s best, race organizers were able to reach a special arrangement with 100 Plus wherein the carbonation of the drink will be removed especially for this race. Each race registrant will be issued race coupons for claiming of race kits. 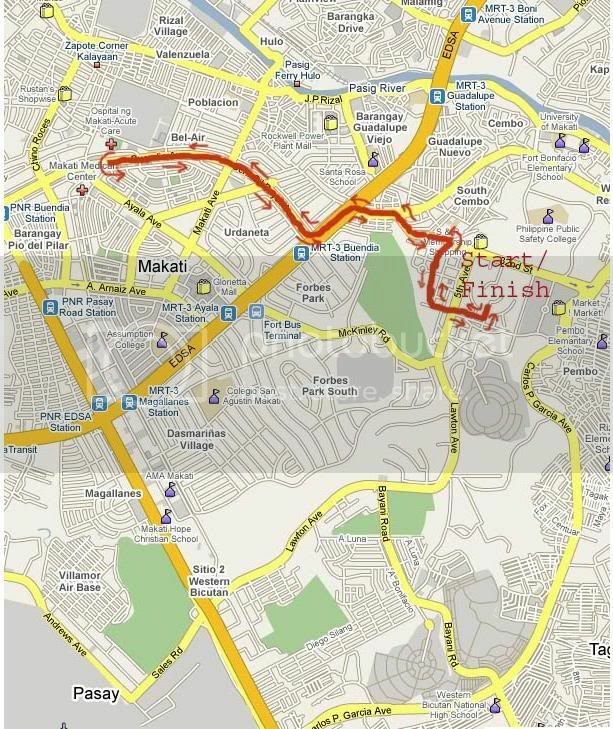 From July 16 to July 18, 2009, race kits will be available for pick-up between 10 to 11 a.m. and will include the official race number, safety pins, route maps, singlet and the disposable electronic timing chip, at the Bonifacio High Street (in front of ROX). All of us present during the event launch have already registered for this event. I encourage you to do so too so that you can also be part of running history. Click here to download route maps for : 3k, 5k, 10k and 21k. Want to see more details regarding this event, click here to go to the official race site. For FAQs, click here. Last Saturday, I was fortunate to be one of the invited runners to test the new Nike Lunar Glide+ running shoes. The original test run schedule was actually supposed to happen several Saturdays ago but heavy rains during weekends prevented us to do so. Not one of us expectedly would want to run on the rain and have our new shoes get wet! On both instances, I was glad to be in the company of a number of runners who mostly are also friends. We were all giddy with excitement while listening to the test run briefing being given by speakers Mr. Tony Atayde, Nike Sports Sales Manager and Mr. Jerwin Ngo, Nike Product Specialist talk about the features and benefits of the new lunar shoes. 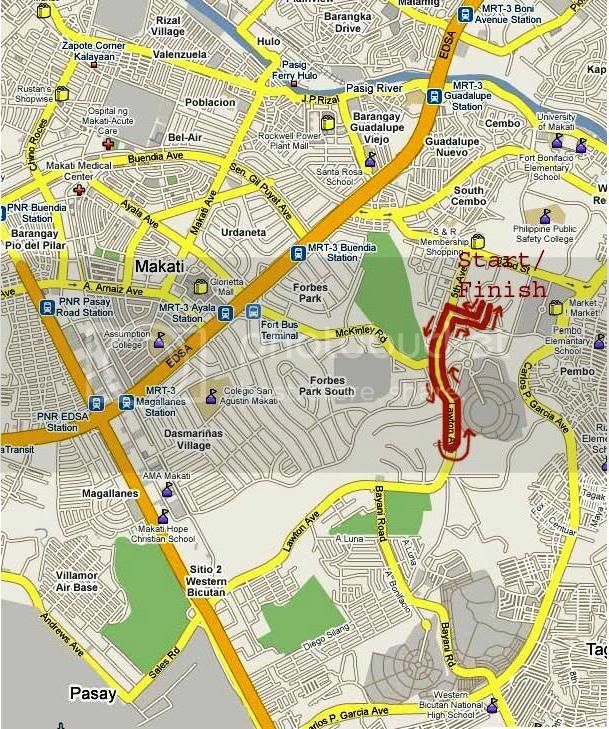 After the briefing, we ran four loops, led by Coach Rio, around Bonifacio High Street to complete 4.8k. The test run was done on an easy pace with most of the participants exchanging stories that borders from funny to utmost hilarious. Oh and of course, the pace also allowed us to have easy photo-op sessions with Ben at one point, the photographer that he is, in an almost-kissing-the-ground-position just to be able to take a good shot of the runners. and the test run finally pushed through! The Nike Lunar Glide+ is supposed to be a wholly improved version of last year’s Nike Lunar. It doesn’t have what used to be known as the Nike Lunar foam but what it has now is the Dynamic Support – an innovative midsole design architecture which in simple words mean that it is supposed to provide superior cushioning and stability by adapting to a runner’s foot type or gait. Having said this, the Nike Lunar Glide+ is touted to be the running shoe for all runners, breaking the myth that runners must compromise their needs by selecting between two industry-standard categories of Stability or Cushioning by providing both in one shoe. Want to know more about the shoe’s technical details? Jaymie (TBR) has posted the technical sheets on both the men’s and women’s version on her blog. The strap over the midfoot of the women’s shoes is a great innovation. This allows personalization of fit. For someone like I who possess narrow feet, an option to be able to adjust the width of my shoes comfortably to my liking is really a treat. It is light. My Nike Air Pegasus has been the lightest running shoe I have had so far but the Glide+ is much lighter. It fits my feet snugly. It is soft and comfortable, especially the inner sole. As soon as I slipped into it, I already felt the soft, cushiony feel of the inner sole – it’s as if my feet are stepping on a pillow. The Nike Lunar Glide+ will be available globally on July 2009 (except for the US where the shoes will have its debut on August 2009). In the Philippines, it will retail at a price of PHP 5,999.00. * See more pics from the first test run attempt here and the second and final one here. 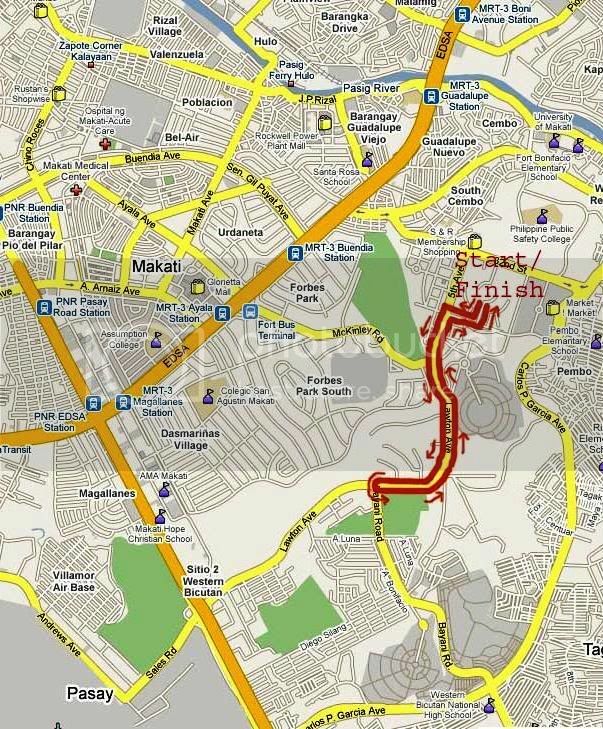 for the Advance Category – participants will have to finish 2 laps/loops of 15k each (for a total of 30k). 2. change in category – if you have already signed up for a particular category and would want to change – upgrade/downgrade, you will need to register again (surrender your existing race kit) to be listed in the new category you would want to be in. Running is the new badminton! I always hear these phrase being uttered nowadays which is meant to point out how running as a sport has evolved in the country. One proof to the running boom is the recent opening of two running specialty stores – RUNNR and Second Wind. I was able to visit both stores and try out the services they offer. I have tried having my foot and gait analyzed and both stores gave the same findings (i have neutral/normal pronation, yehey!). What’s best, both stores has staff who knows about running and are actually runners themselves. Boy, both even have ultramarathoners in their midst . Bottomline, wherever runners choose to go to buy running stuff or avail of running-related services, both store will give value for money. They have good products and friendly and knowledgeable staff. It will really all boil down to a runner’s preference. Runnr Store is located at B3, Bonifacio High Street, The Fort, Taguig. Click here to visit their website. Second Wind Running Store is located at 88 Maginhawa St., Teacher’s Village, Q.C. Click here to visit their website.